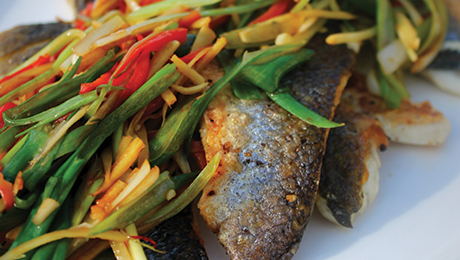 This simple dish combines wonderful Thai style flavours to really compliment the beautifully delicate flesh of the sea bass with crispy skin. Season the fish with salt and pepper, then slash the skin 3 times. Heat a heavy-based frying pan and add 1 tbsp oil. Once hot, fry the fish, skin-side down, for 5 mins or until the skin is very crisp and golden. The fish will be almost cooked through. Turn over, cook for another 30 secs-1 min, then transfer to a serving plate and keep warm. You’ll need to fry the fish in 2 batches. Heat the remaining oil, then fry the ginger, garlic and chillies for about 2 mins until golden, add a dash of soy sauce. Take off the heat and toss in the spring onions. Spoon the contents of the pan over the fillets.